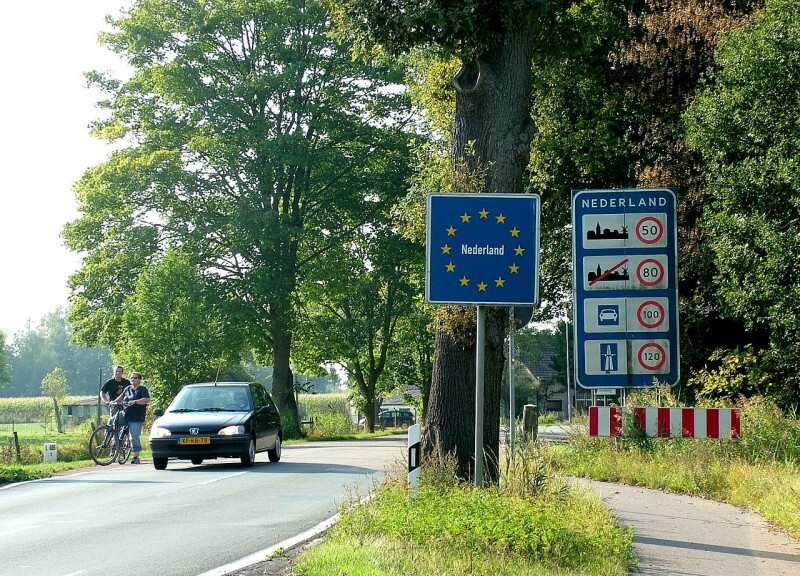 Border between Germany and Holland within the Schengen area, currently not monitored. Image from Wikipedia Commons, republished under CC BY SA 3.0 license. On Sunday, January 11, millions of protesters took to the streets throughout Europe to demonstrate their revulsion against the attempt to suppress freedom of expression and the attack against French magazine Charlie Hebdo. That same day, the interior ministers of European Union (EU) member countries met to discuss a common policy on combating terrorism in Europe. Many think that defending freedom has been short-lived for these leaders, since the measures being considered range from restricting the freedom of movement in the Schengen zone to collecting data on the communications and travel of certain people, as well as closely monitoring the Internet and social networks. Nuestro sistema de valores y libertades está amenazado. 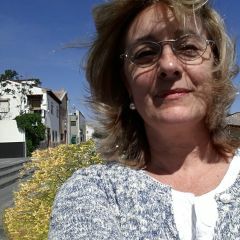 No podemos permitir que los que amenazan la libertad se aprovechen de ella para atentar contra nosotros. Our system of values and liberties is threatened. We cannot allow those who threaten freedom to take advantage of it in order to attack us. EU ministers prepare to press the social media industry – providers such as Google, Facebook, and Twitter – to cooperate in preventing jihadists and terrorists using the internet as recruiting sergeants and propaganda instruments inciting hatred and violence. That surveillance can save lives seems undeniable. However, it is one of the objectives of extremists who are willing to commit barbaric crimes in support of purportedly religious or political ends, that the hard-won liberties of the civil population should be curtailed and that a wedge should be driven between those in society with different views about the degree to which personal freedoms should be sacrificed on the altar of public safety. For David Cameron's proposal to work, he will need to stop Britons from installing software that comes from software creators who are out of his jurisdiction. […] The regime he proposes is already in place in countries like Syria, Russia, and Iran (for the record, none of these countries have had much luck with it). There are two means by which authoritarian governments have attempted to restrict the use of secure technology: by network filtering and by technology mandates. In Germany, the government is preparing a law that allows for the removal of documentation of potential jihadists for three years to prevent them from joining terrorist groups abroad. The Belgian government has asked that a European register of foreign fighters be created, a difficult idea to carry out due to the differences that exist between different EU countries when defining said fighters, as well as in their investigation procedures and ways of obtaining evidence. The president of the European Council, Donald Tusk, has called on the European Parliament to unblock the creation of passenger name records (PNR). This registry contains passenger data, such as names, form of payment for travel, itinerary, and contact details. This not only creates suspicion among many MEPs, but also of the EU Court of Justice, which raises doubts as to its compatibility with European legislation on the protection of personal data. I want to offer the French a referendum on the death penalty. Personally, I think that this possibility must exist. 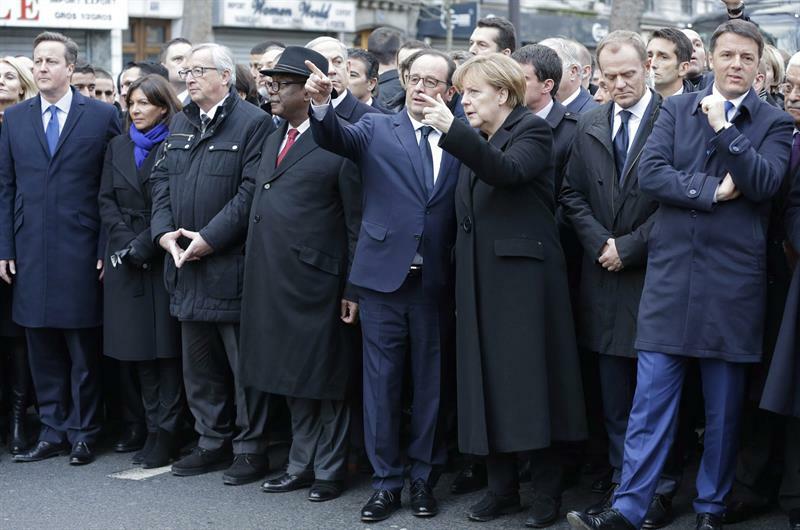 European leaders at the demonstration on 11-1-2015 in Paris, including Hollande, Merkel, Juncker, and Cameron. Image by cuartopoder under CC BY NC 3.0 license. …esa moto ya te la han vendido otras veces, y acabó siendo un timo. (…) ¿No llevamos tres lustros aceptando recortes en libertades y, por el mismo precio, guerras, invasiones, torturas, cárceles secretas? ¿Acaso el mundo es hoy un lugar más seguro?”. … they've sold you this bike several times before and it ended up being a scam. (…) For fifteen years, haven't we been accepting cuts to liberties and, for the same price getting wars, invasions, torture, and secret prisons? Is the world a safer place today? Me temo que de la matanza de Charlie no saldremos con más libertad sino con menos. Ya estamos viendo cómo los ministros de Interior europeos quieren defender la libertad limitando las libertades. Es justo lo que no hay que hacer. No se puede dar un paso atrás ni ante las pistolas ni ante los chantajes. Eso sería darle la razón a los asesinos. Por eso es tan necesaria la sátira salvaje de Charlie Hebdo. La sátira no hace prisioneros ni tiene aliados. Eso y no otra cosa es la verdadera libertad de expresión. I fear that we won't come out of Charlie's death with more freedom, but with less. We are already seeing how the European interior ministers want to defend freedom by limited freedoms. It is exactly what not to do. We cannot take a step backwards before guns nor blackmail. That would mean giving reason to the murderers. That is Charlie Hebdo's wild satire is so necessary. Satire takes no prisoners and has no allies. That and nothing else is true freedom of expression. The real question then is what are we prepared to pay for our freedom? Either it is with the lives of our citizens or it is the encroachment of our freedoms. Unfortunately it could even be both. As always people (and politicians) seem to react to symptoms and not the cause. The question should be asked, why did the attacks in France happen in the first place? It was not about freedom of the press. We seem to forget the attack on a Jewish shop. That was not about freedom of the press nor were any of the previous terrorist acts that have happened in Europe to date. It is simply an extension of a religious war that has been waging for centuries. It is about the conflict that exists between the views of certain Islamist extremists and our capitalistic Western values. If we think we have a problem in Europe, take a closer look at the tens of thousands of deaths around the world that have happened only recently in the name of Islam. As the number of Muslims in Europe have increased, it can be no surprise that a small number of them could have extremist views. The question is how do we deal with this fact? There is no simple solution but history tells us that acts of violence cannot be eliminated with peaceful demonstrations.